Neck pain can come from degenerative discs and joints, neck sprain/strain (whiplash), a herniated disc, or a pinched nerve from bone or disc. Neck pain can also come from swollen lymph nodes, infections, fibromyalgia and polymyalgia rheumatica. Neck pain can be localized in the neck or radiate down into the shoulder area or arms. Pain can range from dull to sharp, intermittent to constant, mild to severe and can even feel like it is numb or tingling. Diagnosis of neck pain comes from a thorough Orthopedic, Neurological and Chiropractic Exam along with a History of the condition from the patient. Further testing can include X-rays, MRI Scan, CAT scan, bone scan, myelogram, and electrical tests such as electromyography (EMG) and nerve conduction velocity test (NCV). 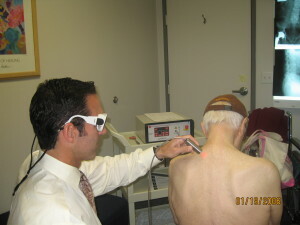 Neck Pain Treatment can include High Power Laser Therapy to reduce spasm; Active Release Technique for chronic muscle spasm and to increase range of motion; Massage; Gonstead Chiropractic Adjustments to restore normal spinal mechanics and Ice Therapy to reduce inflammation. It is advised to avoid sleeping on your side or stomach with neck rotated and with only 1 pillow. Avoid cervical spine flexion and do no watch TV, read or work on your lap top while laying down with your head jacked forward in flexion as this will surely aggravate your condition.